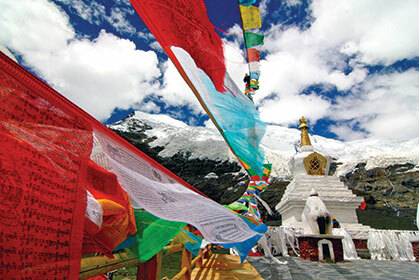 Prayer flags catch the wind against a rugged Himalayan backdrop in Western Tibet. Photos by Nicholas Triolo. Flash and boom and crackle, all at once. I sat upright in my tent at over 16,000 feet in a remote part of western Tibet. It was 2 a.m. The light from my headlamp knifed through the dark to assess the damage. Above, faulty seams. Below, leaching water. Backpack? Wet. Sleeping bag? Wet. Camera? Damn. Wet. Lightning struck so close I felt it surge through my teeth and gums. I stumbled outside, hypoxic, then grabbed a sharp rock and dug trenches around my flimsy tent. Another lightning flash-boomed, illuminating the 21,778-foot Himalayan massif to my right, the one I’d been circling on foot for the past three days: Mount Kailash. Its glacial shoulders splayed out from a shower cap of clouds at the summit, water rushing off its slopes toward four major rivers. 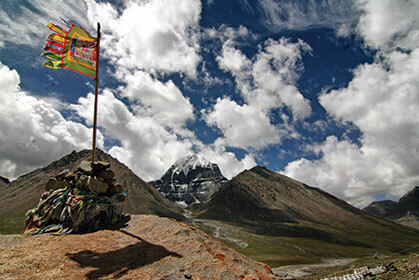 Kailash is the most sacred mountain in the world to over two billion people. Each year, tens of thousands of devout Buddhist, Hindu, Jain and Bon complete the 32-mile kora—circumambulation—around its base. I was one of 20 academics, professionals and explorers who had traveled there to experience the power of the mountain pilgrimage. My obsession with circuitous foot travel, however, began at home, in the Pacific Northwest. And it started with trail running. In the 16,000-foot-high Lha Chu River valley, during the author’s Munt Kailash circumambulation. Running trails in Oregon is like surfing swells on Oahu’s North Shore—conditions are good, stoke is high and competition is fierce. 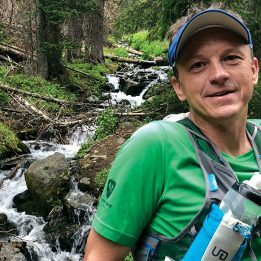 In Portland I discovered ultrarunning, joining the ranks of a young, fast trail community. I was new to running then but couldn’t resist spending hours skipping through the area’s evergreen playgrounds. All across the Pacific Northwest, large volcanoes teepee the landscape, most of them with trails that ring their bases. My love affair with running began along one of these, the Loowit Trail around Mount St. Helens. 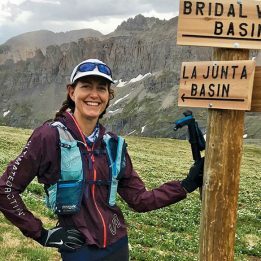 Friends and I would run the 34-mile clockwise orbit, first tackling sharp boulderfields, then running alongside herds of bugling elk, fording rivers, slogging up sandy climbs and refilling handhelds under snowmelt waterfalls. Nearby, the Timberline Trail around Mount Hood offered a similar experience. One early morning in August 2011, seven of us arrived there for a casual adventure run. 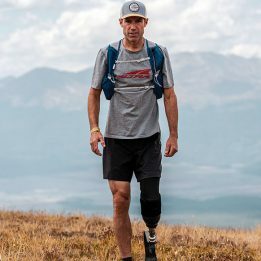 Among the elite talent, I recognized Grand Slam record-holder Ian Sharman, second-place Hardrock finisher Joe Grant and top-10 Western States finisher Yassine Diboun. The wind snapped and flailed hard enough to rip sunglasses off my face. Below us, a sunrise glow blanketed the tumbling foothills—soft lavender fringed with gold. Much like Mount St. Helens, this 42-mile circumnavigation felt complete, diverse. It felt temperamental almost, like I was discovering a more honest version of a friend. South-facing sections, fast to melt, revealed rocks and roots, while northern slopes hid under snowpack. Wildflowers exploded with color on extroverted eastern exposures. For 10 hours, we whirled counter-clockwise, dropping into deep chasms, climbing up washouts with ropes and making off-trail decisions through lingering snowfields. Near the end, I looked back at a particularly striking section where snow draped over the peak into wrinkled green contours below. It appeared as if the mountain wore a flowing white dress that I had been dancing around all day, clinging playfully to its frills. Of course, it was mile 38 and I could’ve just been losing it. Throughout the day, I sometimes felt strong and sometimes struggled—this is the psychophysical interplay that makes circuitous routes compelling. How I felt on one side of the mountain reflected the behavior of the exposure itself—its contours, its trail conditions, its shade and water availability. Mount Kailash, as seen from the north. 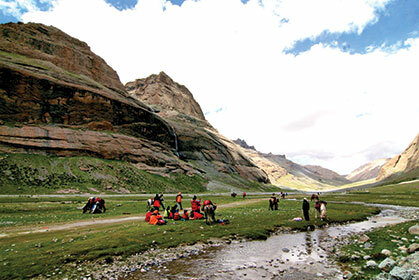 After two days of walking around Mount Kailash, our team crossed 18,600-foot Drolma-La Pass. I had never been that high, and wondered how my body would hold up. Already, my head spun during the day and pulsated at night. But adversity is part of the deal, part of the contract you sign when you circle a mountain. As we made it over the pass and down into the terrible storm that night, I couldn’t help but recall the story of my friend Joe Grant, attempting the unsupported speed record around Mount Rainier’s 93-mile Wonderland Trail in 2011. He was running exceptionally well, with 10 miles to go before he’d shatter the previous record. It was past midnight and he’d been moving nonstop for over 20 hours. A pregnant moon brought a silver sheen to an otherwise dark forest. Suddenly, behind him, a twig snapped. Joe looked back to discover a full-grown cougar, stalking him no more than 25 feet behind. In that moment, he looked into the large cat’s eyes and saw his own mortality looking right back. Joe threw sticks, yelled, roared, puffed his chest and walked backward. Just when he thought he had lost the cougar, the stalking feline would re-appear, eyes burning in the light of his headlamp. When he finally reached a campground, Joe pulled the plug and hitchhiked to his car, defeated and trembling. But alive, more than ever. I couldn’t help but chalk it up to the near-mystical experience of circling a mountain. And that’s part of what brought me to Mount Kailash, what made me fly 8,000 miles on three flights and ride 2,000 miles in a rickety bus. The final day of walking around Kailash was beautiful and dry. When, at last, I made it to the end—where, four days earlier, I had also begun—a different version of me had arrived, haggard, humbled and new. Nick Triolo is a writer/photographer who blogs at The Jasmine Dialogues. This article originally appeared in our October 2015 issue.